Hexvessel refine their love of all things green and folky in a boundless new masterpiece. For those not in the know, Hexvessel is the brainchild of Mat ‘Kvohst’ McNerney, also known for the entirely dissimilar but equally substantial goth/punk rock outfit, Grave Pleasures. Such is the quality of his craft that one is able to fully suspend knowledge of his decidedly more anarchic alter-ego when listening to Hexvessel. All Tree is an emerald trinket, fully able to stand on its own two feet. It is a neatly sewn ensemble of many good things, and mighty in every sense. Whether you’re sitting at home, or readying for that outdoor trek, this is very much the record to plug in your ears. Those same ears may also be not surprised to learn that McNerney has Norwegian black metal in his blood. Though there is not a single scream or overbearing shriek of guitar distortion to be found in this record, much of the melodic elements run parallel to the more emotive hallmarks of this genre. Try to think of those times when vintage prog rock shook hands with black metal and decided to mellow out for the day. You may then have a workable model of what All Tree sounds like. 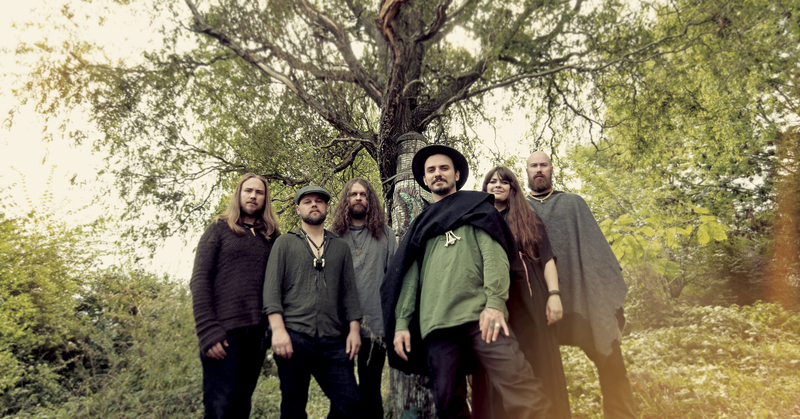 But above all else, Hexvessel intend to declare themselves as folk, or ‘wyrd folk’ to be exact – a charismatic reflection of woodland folklore, flavored with lashings of fantasy, and traditional pagan myths. When considering this, one can ascertain just how rich the earthy map of All Tree really is. Amidst the distinct Tolkien-esque nuances, All Tree‘s mix of classic 70s prog and modern, death/black metal-inspired prog runs strong and blends together as if by magic. As is the nicely authentic folklore which the album depicts, All Tree sings out with a divine balance of the old and the new. When the acoustic elements ring out, they do so with the utmost passion. Acoustic melodies tend to comprise the musical bulk of this record and are accompanied by a lively ensemble of drums, pianos, and flutes. Sometimes jolly, and at other times brooding, there is no instance where these elements do not work harmoniously. There appears no intent for any singular element to stand above the rest, as this is not a project by which to showcase excessive technical flair. In each of the album’s 13 tracks, they operate to serve a greater and highly emotive whole. Though Hexvessel exude pride in their identity, heritage, and beliefs, I gauge All Tree to be an album fully welcoming to the masses in all their respective guises. Their music has a deep, yet gentile, yet extremely assiduous quality that is virtually impossible not to get lost in, and its emotional undercurrents can be reforged at the listener’s discretion. With such fresh breathing space inside the instrumental layers and refined production, one can consider this partly fantastical opus a true record for the people, whoever and wherever they may be. It’s a labor of love. It’s a craft of artisan standards. It’s a patiently epic and flawlessly natural escape with a distinct human voice. It is a romantic stroll through the forest of human thought, where the trees whisper in theatrical ballads of the here-and-now, and the ages gone by. Hexvessel had a lot in their stores, and they gave it all to us in the space of one album. All Tree is all heart and a wonderful experience from whatever perspective you choose to hear it.